We expect to have close to 700,000 cumulative doses of H1N1 vaccine in the state by January 4th – enough for more than half of the state’s population. The nasal spray vaccine is generally more available than injectable vaccine. We request that nasal spray vaccine be given to anyone who is eligible to receive it. The nasal spray vaccine is a safe and effective vaccine option for healthy people ages 2 through 49 years old who are not pregnant. For more information on nasal spray vaccine, please see our Fact Sheet at: http://www.maine.gov/dhhs/boh/maineflu/LAIV_factsheet.pdf. We have and expect sufficient supplies to meet the demand for vaccine on a weekly basis, but it often takes 7-10 days to replenish a health care provider’s vaccine supply. Additionally, we have experienced delays in distributing vaccine the past two weeks primarily due to federal CDC holiday shipping schedules and to some degree the state shutdown day. We expect these delays to dissipate the first week of January, though snowstorms in Maine or on the East Coast can also cause some delays. We are extremely grateful for the thousands of Maine health care providers who have been offering vaccine to their patients and volunteering with many vaccination efforts. We hope to continue and even increase these efforts now that more vaccine is flowing into the state, since this is our window of opportunity to protect people before the next wave of H1N1 infection and as H1N1 continues to circulate. Our first priority is to make sure traditional health care providers (hospitals, private practices, health centers, home health agencies, municipal health departments) have sufficient vaccine. We are also increasingly distributing vaccine to other health care providers, such as those in employment and in retail settings. Offering vaccine in these other settings will help serve many people who may have difficulty seeking vaccine in traditional health care settings and will help reduce the burden on traditional health care providers. Vaccination is the best way to protect patients and to slow down the circulation of the virus, which will also help to prevent changes in the virus. Maine CDC encourages all appropriately licensed health care providers to register for, order, and offer H1N1 vaccine to their patients, including those health care providers in non-traditional settings for vaccine, such as specialists and those providing care for populations who may not seek vaccine, such as those with serious mental illness. 1. Register for a PIN: http://www.maine.gov/dhhs/boh/maineflu/h1n1/provider-agreement-2009-2010.shtml. 2. Once the PIN is received, place an order for vaccine:http://www.maine.gov/DHHS/boh/maineflu/h1n1/health-care-providers.shtml. Please note that all H1N1 vaccine providers and/or administrators must submit the vaccine administration data into Maine CDC’s weekly vaccine reporting system. The weekly vaccine reporting form can be found at: http://www.maine.gov/dhhs/boh/maineflu/h1n1/health-care-providers.shtml. Detailed instructions are also available at: http://www.maine.gov/dhhs/boh/maineflu/h1n1/H1N1-Weekly-Reporting-Form-instructions.pdf. Confirm that you have placed orders for all the vaccine you need. You may order more by completing this form: http://www.maine.gov/dhhs/boh/maineflu/h1n1/hc-providers/h1n1-vaccine-orderform.shtml. It often takes 7-10 days to replenish a health care provider’s vaccine supply. If you have acute vaccine needs or other related concerns or questions, email flu.questions@maine.gov or call the Immunization Program at: 287-3746 or toll free at 1-800-867-4775 Monday – Friday 8 am – 5 pm. If local vaccine supplies are not sufficient while awaiting more vaccine, Maine CDC recommends focusing the limited supply on those patients in the five high priority groups (pregnant women, people ages 6 months through 24 years-old, people 25 through 64 years-old with an underlying medical condition, caregivers and household contacts of infants younger than 6 months, and health care workers). 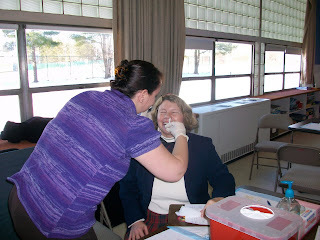 Patients can also be referred to public clinics which can be found by calling 211 or checking www.maineflu.gov. When a health care provider’s vaccine supply is sufficient, we recommend offering vaccine to every patient at every visit, so long as there are no contraindications for receiving vaccine. It is important to take advantage of this window of opportunity (declining disease burden and expanded vaccine supply) to encourage vaccine. Health care providers who have sufficient supplies and no longer need vaccine that is being shipped to them should contact their local vaccine coordinator to arrange for redistribution. The only vaccines that should be returned are those that arrive non-viable or appear to be damaged during transit. Providers with concerns about vaccine viability during transit from the McKesson Distributor should call 877-836-7123 immediately upon receipt of the package. Once a provider takes receipt of the vaccine as a usable product, it is that provider’s responsibility to ensure proper disposal of any damaged, expired, or un-used vaccine unless it has been recalled. Health care providers who have sufficient supplies and no longer need vaccine they receive should contact their local vaccine coordinator (listed above) to arrange for redistribution. Those who have questions about H1N1 vaccine dose spacing and administration with seasonal flu or other vaccines should consult this table from US CDC: http://www.cdc.gov/H1N1flu/vaccination/dosespacing_admin.html. Additional vaccine-related information for health care providers, including information on billing and consent forms can be found on our web site at: www.maineflu.gov or specifically on: http://www.maine.gov/DHHS/boh/maineflu/h1n1/health-care-providers.shtml. Four deaths due to H1N1 have been reported, bringing the total to 17 since August. Please note that an estimated 150 people die in a normal flu season in Maine. We are now recommending H1N1 vaccine be made available to anyone who wants it, as local supply allows and with an emphasis on prioritizing injectable vaccine for those at highest risk for complications. A non-safety recall has been issued for about 800,000 doses of H1N1 vaccine nationwide. We expect the H1N1 flu virus to continue to circulate and additional surges are also possible. We expect to experience a seasonal flu surge as well, as we normally do sometime in the winter. There is still more influenza across the country than is usually seen this time of year, and vaccination remains the best protection against the flu. 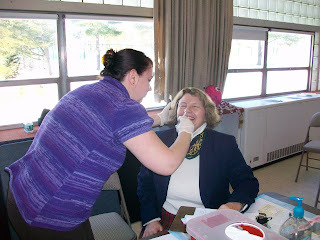 Now is an excellent time to get vaccinated, so you will be protected during the next wave of flu. Data indicate that H1N1 flu has been relatively mild in Maine compared with other states, and continues to decline. Nationally, data indicate that H1N1 is striking young people the hardest. However, there were four deaths among people older than 64 since last week’s update. Those individuals lived in Androscoggin, Kennebec, Knox, and Oxford counties. Note: Three deaths were reported to Maine CDC after the surveillance information at the end of this report was compiled, and therefore will not be reflected in that data. All 17 deaths since August have occurred in people with underlying health conditions. People with underlying health conditions should seek vaccine at their specialty providers, primary care providers, or at public clinics listed at www.maineflu.gov. Anyone with underlying health conditions who experiences flu-like symptoms should contact his or her health care providers immediately to receive a prescription for antiviral medications (such as Tamiflu®). There were 11 new hospitalizations due to H1N1 in the last week, down from 31 the week before, all ages 25 and older. One individual older than 64 required intensive care. Counties of those hospitalized this past week are: York, 3; Franklin, Penobscot, and Somerset with two each; and one each in Hancock and Knox counties. Outbreaks were reported in one long term care facility, one acute care facility, one K-12 school, and two other institutions. The outbreaks occurred in Androscoggin, Cumberland, Oxford, and Penobscot counties. Since October, we have received more than 500,000 doses of H1N1 vaccine in Maine. Based on recent demand, Maine CDC is now recommending that H1N1 vaccine be offered to anyone who wishes to receive it when local supplies allow. The focus for vaccine will still be the five high priority groups as defined by US CDC, but in many places public clinics will not need to turn others away. We are encouraging health care providers with sufficient supplies to provide vaccine to all who want it, and those without sufficient vaccine to focus their vaccine supply to those in the high priority groups: pregnant and recently pregnant women; household members and caregivers of infants younger than six months old; all people ages 6 months through 24 years; people ages 25 through 64 with underlying health conditions; and health care and EMS workers. The nasal spray vaccine is available in slightly greater quantities than injectable vaccine. If healthy people who qualify for the nasal spray are given injectable vaccine, this can easily deplete the injectable vaccine supply for those who are most vulnerable to being hospitalized or dying from H1N1. Therefore, we request that nasal spray vaccine be given to anyone who is eligible to receive it. The nasal spray vaccine is a safe and effective vaccine option for healthy people ages 2 through 49 who are not pregnant. Nasal spray flu vaccine is not new. It has been used successfully in many settings for seasonal flu vaccination since 2003. Even if you come into regular contact with people who cannot receive the nasal spray vaccine themselves you may still be able to receive the nasal spray vaccine as long as you are healthy, not pregnant, and age 2 through 49. The nasal spray vaccine is safe for breastfeeding mothers. Health care workers who cannot receive the vaccine themselves (due to pregnancy, health condition, or age) may still administer the vaccine. The benefits of getting the H1N1 vaccine far outweigh the very small risk of serious complications from vaccination. Some people getting vaccinated will have mild side effects such as pain, redness or swelling in the arm where the shot was given or a runny nose and headache after the nasal spray vaccine. US CDC and FDA carefully monitor vaccine reports. After millions of doses of H1N1 vaccine being administered in the U.S., the number, pattern and types of adverse event reports are similar to what we see for seasonal influenza vaccine. More than 90% of adverse event reports nationwide have been classified as not serious. Over the coming days and weeks, vaccine will become more available in a variety of settings, including health care provider offices, public clinics, retail locations, large employer settings, nursing homes, etc. People have three easy options in seeking vaccine: check the clinic locator at www.maineflu.gov, call 211, or call their health care providers. About 800,000 doses of H1N1 vaccine in the .25 mL pre-filled syringe presentation manufactured by Sanofi Pasteur and approved for children ages 6-35 months have been recalled due to questions of potency. This is not a safety recall. Maine CDC notified 25 practices on Wednesday that they had received some of the recalled lots of H1N1 vaccine. The remaining vaccine from these lots was pulled from their shelves. About 4,500 doses of the recalled lots had been recently shipped to Maine, and reportedly many of those had not been administered yet. Because there were no safety concerns and the vaccine was slightly weaker than the license standards called for, there are no recommendations for the children who received the vaccine except to proceed with their second dose as would normally occur. All children less than 10 years old should get the recommended two doses of H1N1 vaccine approximately a month apart for the optimal immune response. Therefore, children less than 10 years old who have only received one dose of vaccine thus far should still receive a second dose of 2009 H1N1 vaccine. Parents of children who received vaccine from the recalled lots do not need to take any action, other than to complete the two-dose immunization series if not already completed. Nationally and in Maine we are seeing gradual declines in flu activity; however, there is still a lot of influenza everywhere. It is possible that other waves of activity may occur – caused by either H1N1 or regular seasonal flu – and people should continue to take precautions, including seeking vaccine when it is available. Maine CDC is partnering with 211 Maine to provide confidential information and referrals related to the flu to the general public from 8 a.m. to 8 p.m. seven days a week. To date, more than 300,000 doses of H1N1 vaccine have arrived in the state, but this is still less than half of what will be needed for all prioritized groups in Maine. Since the last update, there have been six additional deaths due to H1N1, bringing the total to 11 reported since August. All of the recent deaths have occurred in people over the age of 25 with one each in Androscoggin, Franklin, and Washington counties and three in Penobscot County. All deaths related to H1N1 in Maine have occurred among people with underlying health conditions. People with underlying health conditions who experience flu-like symptoms should contact their health care providers immediately to receive a prescription for antiviral medications (such as Tamiflu®). Please note that one of these recent deaths was reported after the surveillance report at the end of this update was finalized. There were 25 new hospitalizations due to H1N1 in the last week (down from 50 two weeks ago). Of those hospitalized, all were adults and five were admitted to intensive care units. Counties of those hospitalized this past week are: York, 5; Cumberland, 4; Androscoggin, 3; two each in Franklin, Kennebec, Penobscot, Piscataquis, and Washington counties; and one each in Knox, Oxford, and Waldo counties. Seventeen schools reported absenteeism greater than or equal to 15% due to influenza-like illness in the past week. In a normal flu season in Maine, fewer than half a dozen schools usually report high absentee rates. High absenteeism was reported in Androscoggin, Aroostook, Cumberland, Kennebec, Knox, Oxford, Somerset, Waldo, and Washington counties. The timing, spread, and severity of flu viruses is unpredictable with outbreaks often occurring in waves. Even after flu activity peaks during the current wave, it is possible that other waves of activity may occur – caused by either H1N1 or regular seasonal flu viruses. It is also fully expected that H1N1 virus will continue to circulate for months if not years to come. People should continue to take precautions to prevent serious illness by staying home when sick, covering coughs and sneezes, washing hands frequently, and getting vaccinated against both seasonal and H1N1 flu when vaccine is available. Flu infections can make people more likely to develop pneumococcal infections, which can cause serious complications, including death. All children younger than 5, all people between ages 5 and 64 with high risk conditions, and all people age 65 and older should receive a pneumococcal vaccine. For more information, see this US CDC Q&A on pneumococcal disease: http://www.cdc.gov/h1n1flu/vaccination/qa_pneumococcal_disease.htm. Maine CDC has contracted with 211 Maine to provide confidential information and referrals to the general public related to H1N1 and seasonal flu. Since August, staffing of Maine CDC’s information line has been limited to business hours. The partnership with 211 Maine will allow people to dial 2-1-1 to obtain information and referrals from trained 211 staff from 8 a.m. to 8 p.m. 7 days a week. The H1N1 vaccine is made the same way as seasonal flu vaccines. Although GlaxoSmithKline asked the Canadian government to stop using vaccine doses from one particular lot shipment, none of that vaccine had even been available in the United States. The benefits of getting the 2009 H1N1 influenza vaccine far outweigh the very small risk of serious complications from vaccination. Some people getting vaccinated will have mild side effects such as pain, redness or swelling in the arm where the shot was given or a runny nose and headache after the nasal spray vaccine. US CDC and FDA are carefully monitoring the H1N1 vaccine reports and after millions of doses of vaccine being administered in the U.S., the number, pattern and types of adverse event reports are similar to what we see for seasonal influenza vaccine. More than 90% of adverse event reports have been classified as "not serious" and are things often seen after vaccinations, such as soreness at the vaccination site. We currently have 301,900 doses of vaccine in Maine – which is about 43% of what is needed for priority populations in the state. For this reason, Maine CDC has had to prioritize within US CDC’s priority groups for vaccine, based on trends in infections, the type and amount of vaccine available, and readiness of partners to administer vaccine. Nearly all K-12 schools have offered vaccine to their students. We continue to distribute vaccine to K-12 schools to complete all first doses and offer second doses to children ages nine and younger. We have been distributing increasing amounts of vaccine to larger numbers of health care providers, primarily for pregnant women, young children, and people with health conditions. People ages 25 through 64 with underlying medical conditions, including COPD, asthma, chronic heart disease (except hypertension), kidney disease, liver disease, cognitive disability, neurologic/neuromuscular, blood disorder, metabolic disorders (including diabetes) or compromised immune systems (including HIV, organ transplant, people undergoing chemotherapy). The following healthy health care providers are also prioritized: inpatient and outpatient health care workers with frequent direct contact with high priority patients and infectious materials, including all EMS as well as nurses and doctors working in outpatient primary care practices, specialty practices, and schools. The main reason health care workers should be vaccinated is to protect the patients they serve, who more likely fall into high-risk categories. The best way to protect these patients is to vaccinate them when the appropriate formulation is available. We ask that healthy health care workers be offered nasal spray vaccine whenever possible, which is only licensed for otherwise healthy and non-pregnant 2- to 49-year-olds. Vaccine supply should be able to support more public clinics for high priority populations by the end of this month. We also plan to distribute some nasal spray to residential college campuses in order to offer vaccine to this group before the winter holidays. Once all of the prioritized groups have been vaccinated, we anticipate that there will be enough vaccine for anyone who wants it. We hope that is soon, and it is our strong desire that everyone in Maine be offered this vaccine as soon as possible. Children nine and younger require a second dose of vaccine at least 21 days after the initial dose for full immunity; US CDC recommends a period of 28 days between doses. There is no maximum number of days between doses. Although it is preferable to receive the same type of vaccine (nasal spray or injection) for both doses, it is not required. Due to the formulation of vaccine currently coming into the state, we are now able to begin offering second doses for children nine and younger in some areas. Vaccinators should follow the vaccine screening form to determine if sufficient time has passed between doses. Documentation of the first dose should not be required before administering a second dose. If a second dose is inadvertently administered early, it will not cause harm. In settings where supply is limited, first doses should still be prioritized.